It’s the 1930s in rural Mississippi. The people are black and white, but the issues that surround them are not. You have three brothers– one older and two younger– and you remember a time when trees could sing. Your name is Cassie Logan, and you are 8 years old. 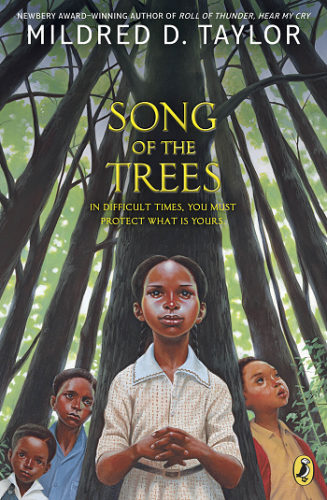 Song of the Trees is the first book in a series that detail the Logan Family saga. This 80-page short novel tracks the tough choices of the Logan family, as they make decisions about the things they own and care about, in the face of the Great Depression. A part of what makes this story so vivid and powerful is that readers clearly experience the events though the innocent eyes of Cassie herself. Teachers can use this book to support Common Core Anchor Standards for Reading, specifically Grade 6, Craft and Structure: Assess how point of view or purpose shapes the content and style of a text. Before reading the story: Ask students to imagine they need money to support their family, but the only valuable thing they own is a beautiful piece of land that has been a part of their family for generations. Would you sell the land to get more money today or save the land to support your family in the future? Remind students to use details from their personal experiences to support their choice. Answers can be recorded in a science notebook or journal. While reading the story: Cassie Logan finds comfort and safety in the forest. Challenge students to describe a place where they find safety and comfort today. How is this place alike and different from Cassie’s forest sanctuary? Answers can be discussed in a Think-Pair-Share or small discussion circles. After reading the story: Choose a single character for deeper analysis. Ask students to draft a character sketch by reviewing their character’s actions, words, and how other people in the story respond to their chosen character. Have students record these observations using a simple graphic organizer, and use these details to reveal insight into their character’s personality traits. Song of the Trees is followed by: Roll of Thunder, Hear My Cry (1976), Let the Circle Be Unbroken (1981), The Road to Memphis (1990), and a prequel, The Land (2001). # 34 – Who Works in this Forest? # 3 – Who Owns America’s Forests?